Since today is Friday and it’s also pay day for most of us, I have put together a wishlist of some of my favourite items from ASOS, which no doubt, will be purchased at some point this month. I am loving extra long sleeved tops at the moment, especially jumpers. And if they come with a turtleneck, then I am pretty much sold. I have always wanted to try a bomber jacket and this one in khaki green seems perfect and looks lovely paired with jeans or even these leather look peg trousers. As for the long tweed trousers, there’s just something uber cool about them and I can see myself styling them with a plain black turtleneck jumper and some classic heels. The sandals are similar to one of my favourite pairs bought last summer which are also from ASOS. These have a smaller heel and a edgier feel to them, definitely something I’d love to rock this coming summer. 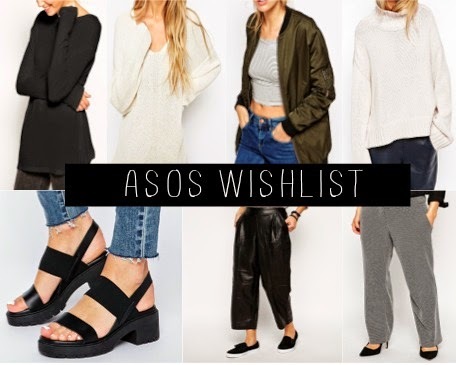 Do you have an ASOS wishlist? If yes, I’d love to know what’s on there. You're tempting me to go shopping!